There is now an immigration application centre in London boasting orchids, cookies, cakes, bottled fizzy water and even a cappuccino machine. Branded ‘The Premium Lounge’, this luxury centre is one of the latest iterations of the government’s continued privatisation drive. High profile outsourcing failures such as Interserve and Capita have led to questions around the sustainability of private companies managing crucial public services, yet the government has not shown any signs of curtailing the practice. Last year, French company Sopra Steria was handed a £91m contract to help ‘digitise’ the UK’s visa and immigration system. It has now opened almost 60 new UK Visa and Citizenship Application Service (UKVCAS) centres for processing paperwork. At £200 per visit, the Premium Lounge is the most expensive of these centres, but they all offer the same core service, a way to upload scans of important documents like passports rather than risk losing them by posting them to the Home Office. In time, the government has said it will phase out the old postal option and most applications will be processed via a Sopra Steria outlet. 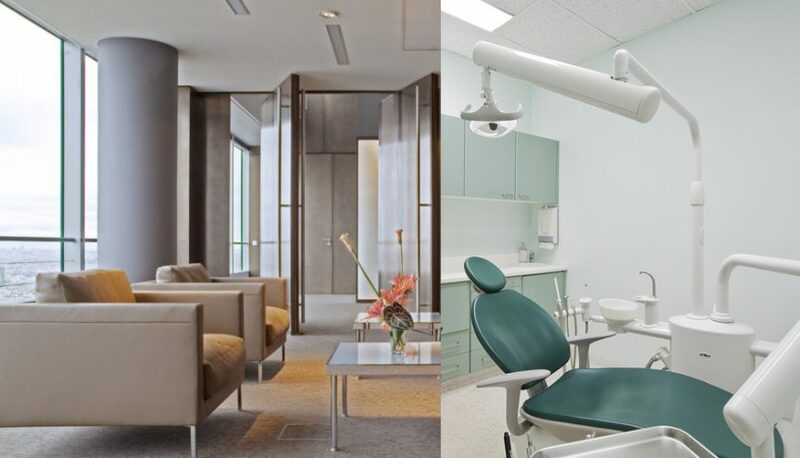 Friendly staff and a private room made Jennifer’s experience comfortable, but she found it hard to understand the fundamental purpose of the processing centres. “They took my paperwork, made sure it looked right and then uploaded it to the Home Office’s system,” she said, “basically [they acted] as a sort of paper validator”. Sopra Steria also collected biometric data (fingerprints, photographs, etc) but this was previously taken at free centres run by the Home Office, making the overall cost of the experience hard for Jennifer to make sense of. Some of the Premium Lounge cost is obviously due to luxury extras, but the Sopra Steria service is expensive even at most of the basic centres. Document uploading is only free at six outlets: Belfast, Birmingham, Cardiff, Croydon, Glasgow and Manchester, while the other 50 centres charge at least £60 per person, meaning many are forced to pay or to travel long distances to avoid extra costs. Danielle Blake, an Immigration Caseworker with the Immigration Advice Service (IAS), worked with a client living in Bath whose nearest free centre was around 25 miles away in Cardiff. “In a situation like that you have to take the entire day off work, as well as pay extra to get there,” she said. It is unclear why appointments are charged at some centres and not others, but the implications are clear: the policy has created a clear geographical disparity in access to immigration services. People living in big cities with no free option, such as Liverpool and Newcastle, are particularly badly accommodated by the new service, along with anyone in Northern Ireland or Scotland where there are only free centres in Belfast and Glasgow. 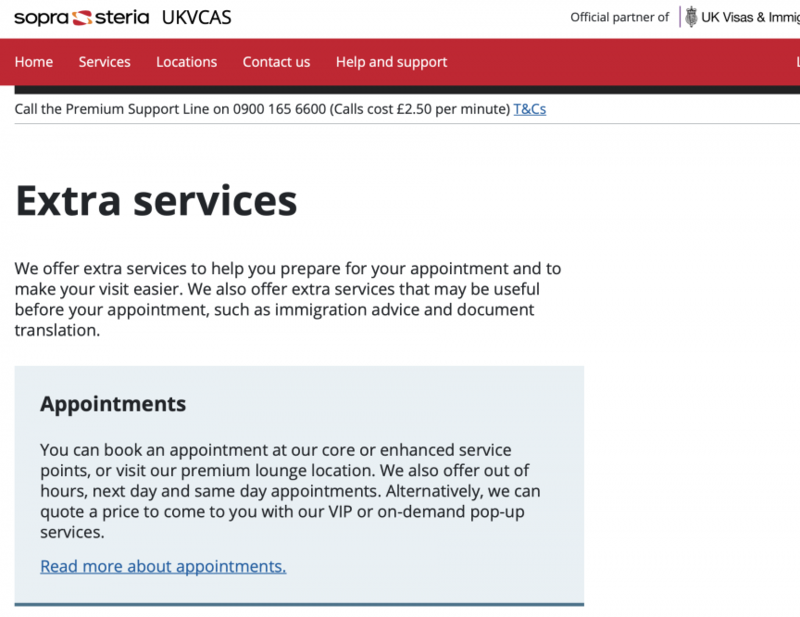 Waiting times for appointments at the Sopra Steria centre in Croydon, the only free outlet in London, were weeks long when Jennifer booked her appointment. She added that the cost of travelling for a free application for a whole family, including taking children out of school for a day and perhaps taking unpaid leave from work, could add up to hundreds of pounds. Even applicants using free centres can rack up extra costs. Sopra Steria’s website lists ‘value added extras’ such as evening or short notice appointments for £100, document checking for £35 and interpretation for £60. The option of a ‘pop up centre’ for offices with large numbers of staff needing visas is priced on request, and in-home appointments are available for upwards of £9,000. During Jennifer’s visit, her advisor mentioned they offered legal advice but this, it turned out, was not included in the Premium Lounge fee. “It seems like they are equipped with everything to do your application but it’s all luxury add-ons. You end up paying [extra] for everything,” she said. Sopra Steria also advertise the services of two other firms: the World Migration Service and BLS International, which help with legal assistance and document translation. The legality of this has been questioned by Richmond Chambers, a law firm specialising in immigration. Richmond chambers believes promoting these companies may present a conflict of interest because, in doing so, Sopra Steria are ‘endorsing the advice of a business in which it holds a commercial interest’. While people are still able to make their own arrangements for having non English language passports and birth certificates translated, some may feel pressure to use a company they see as being verified by their immigration processor. Another issue raised by solicitors and immigration advisors is frequent instances of clients paying for a ‘luxury add-on’ and then not receiving the service they expect. Freddy Russell, an advisor at Kings Cross Barristers, described working with a man who spent over £3,000 on a Premium Service package (a separate entity to the Premium Lounge), which offers a quicker decision. He had experienced wait times of several months in previous years and was scared of being stranded in limbo so he spent his savings on what he believed was a next working day decision. He actually had to wait far longer because in reality the extra money only guarantees the paperwork will be received by the Home Office within 24 hours, not that the department will respond in this time. Marija Stricevic, a Case Worker at Reiss Edwards Immigration Solicitors, said she had also experienced several clients paying for a priority decision and expecting to receive it by the next working day, suggesting a fundamental issue with how Sopra Steria advertises its services. “People have ended up paying large amounts of money for a service they then don’t receive,” she said. Almost everyone interviewed also complained about having difficulty contacting Sopra Steria. Several raised concerns about a private company not being held to the same standards as a government department. Most people had avoided phoning Sopra Steria because the cost is prohibitively expensive, with calls charged at £2.50 per minute. Stricevic said that contacting the company about specific applications is also difficult since individual centres do not have a direct phone line. There isn’t even a simple way for a customer to call and check they have the right documents in advance, which could leave them having to pay for a second costly appointment if something goes wrong. Blake, the caseworker in Bath, phoned the expensive number listed online because of a technical issue completing a web form. She ended up spending half an hour on the phone talking through the entire application. She was, however, unwilling to complain for fear of compromising her client’s application. “You don’t want to do or say anything that would make the situation harder. It can be intense if things go wrong,” she said. Labour recently announced plans to stop private companies getting involved with services relating to the rights of vulnerable people, in recognition of the difficulties that arise because private companies don’t operate under the same rules as government departments. Freedom of Information legislation, for example, does not apply to Sopra Steria. Similarly, staff do not undergo the same training, or hold the same level of responsibility, as those working directly for the government. Business relationships, such as the agreement with BLS International, are less easy to subject to scrutiny. At the same time, a company holding a sensitive public contract isn’t held to the usual standards of a private business, either. People don’t have the option to shop around if they have issues with the way Sopra Steria runs its centres. It’s also clear that any company whose customers are scared to complain for fear of jeopardising their immigration status holds considerably more power than a ‘normal’ private company. Sopra Steria were contacted for comment but were not able to provide a response within the time frame.